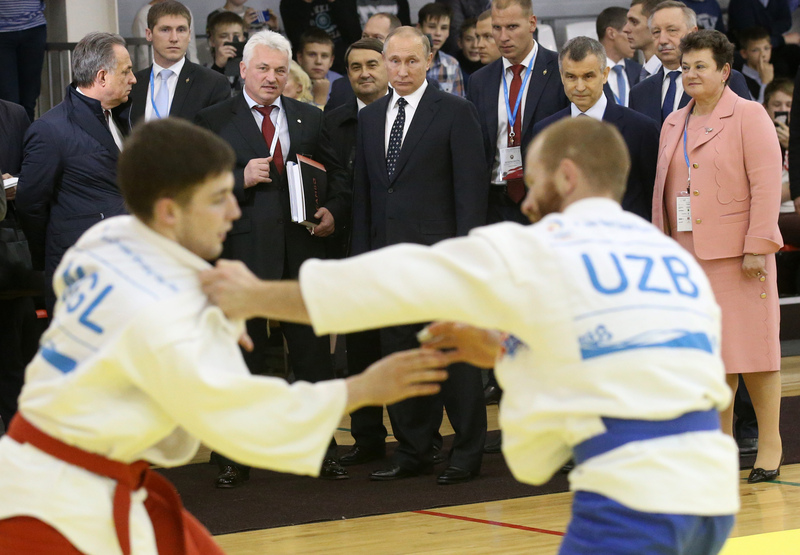 Russian President Vladimir Putin watched a training session of young athletes and learned about various training programs and sambo trends offered by the festival program. Russian President Vladimir Putin, who arrived in the town of Kovrov in the Vladimir region in central European Russia to attend the Russia - Country of Sports forum, visited the Days of Sambo in the Vladimir Region festival. The Russian leader watched a training session of young athletes and learned about various training programs and sambo trends offered by the festival program. Sambo wrestling originated in Russia in the 1920s, when soldiers of the then-Soviet Army developed their own hand-to-hand combat technique. The word Sambo is a Russian acronym, which stands for "self-defense without weapons." Nowadays, according to the All-Russia Sambo Federation, about 500,000 people in Russia, including 230,000 children, practice sambo. In 2003, this sports discipline was officially recognized as a national top priority sport in Russia. The sixth international sports forum Russia - Country of Sports is currently held in Vladimir Region. The forum was founded in 2009 by a decree of Russian President Vladimir Putin with the aim of developing and popularizing sports in Russia. It was first held in October of 2009 in the city of Kazan. This year’s forum has brought together more than 3,000 participants both from all across Russia and from foreign countries. Among its participants are members of the Russian government, lawmakers, representatives of the International Olympic Committee (IOC), heads of national and foreign sports federations.